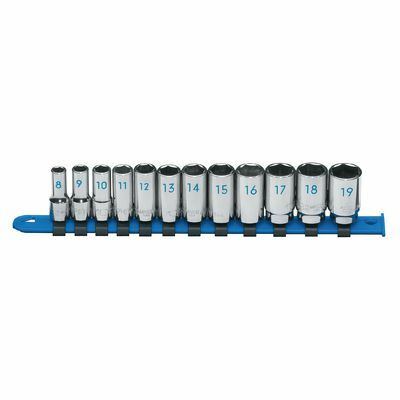 3/8'' DRIVE 12 PIECE METRIC 6 POINT MID-LENGTH CHROME SOCKET SET is rated 5.0 out of 5 by 3. Rated 5 out of 5 by cleetus from top notch i use these for 90% of my 3/8th needs. the perfect depth for mechanics. i've had my set for years and have had no problems. down graded features because the laser etchings wore off after a while. their socket rails are the best too. Rated 5 out of 5 by RustFarmJohn from Nice features. Great quality. So far I'm impressed with my new semi deep metric sockets. I especially like that the socket sizes are printed for easy viewing on the side of the socket. Rated 5 out of 5 by AZNick from This product is high quality and very durable This socket set is awesome! The mid-length is great to break loose tough fasteners! A must buy!